New Jersey Senator, Cory Booker, hosted a New York City Happy Hour event on what turned out to be the hottest day of the summer, or at least it felt like it. After attempting to curl my hair, I trudged up to 35th street through the thick humid air. My red, white and blue strapless Shoshanna dress clung to my body with sticky sweat, and the general vibe on the street was angst. Upon arrival, the concierge instructed me to head up to the roof. "Is it that obvious?" I thought, glancing down at my Hillary themed tote bag. I found some Babes For Hillary mingling together near a massive fan. 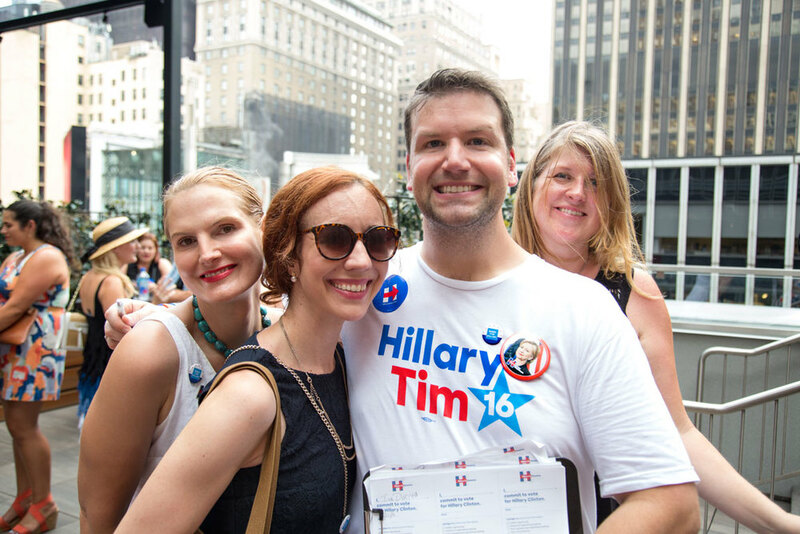 Our Community Outreach Director Caileigh Scott, and Event Organizer Ella Frederick, introduced me to some few new friends, and I handed them Hillary buttons. I love making new friends this way. "Hi, I'm Kristen! Here's a free button. Now, let's talk about how much we love Hillary." It has been successful thus far. The modest stage was lined with a modest velvet rope. We positioned ourselves as close as we could without physically being on the stage. I felt a little "fan girl" about it, but it was too hot to think completely clearly. However, looking back on it now, I think fanning over Cory Booker is absolutely acceptable and frankly, it's expected. The last time I photographed Senator Booker, Hillary Clinton and Bon Jovi were in the house, and at that time Hillary was not yet our First Female Democratic Nominee. It was a different kind of conversation this time around. The Party had come a long way since June 1st. We not only nominated Hillary, but the Democrats held an incredible National Convention including speeches from (listed in order of importance in my opinion) Hillary Clinton, Barack and Michelle Obama, Katy Perry, Chelsea and Bill Clinton, Tim Kaine, Senator Cory Booker, and so on...a star-studded celebration! Senator Booker is a storyteller, and truly has a gift for public speaking. I could see the joy and delight on everyone's faces, specifically when he discussed his relationship with his mom. Senator Cory Booker sweating it out with us for Hillary! Photos by Kristen Blush. "There is such a thing as a stupid question." Senator Booker stated, then paused for dramatic effect. "Following my speech at the DNC, I was asked, 'would you like to join Bill Clinton in his box?'" He was smiling ear to ear. "But I was with my mom! So, I had to ask, 'May I bring my mom!?'" The crowd is laughing at this point. I'm picturing Bradley Cooper with his adorable mom on his arm on the Hollywood Red Carpet, only this is politics, and John Lewis was there. But the highlight of the Happy Hour for me was when Senator Booker talked candidly about Hillary. Any new glimpse into the world that is Hillary Clinton is solid gold. Hillary is really what we all have in common here, after all. "Hillary's intention and motivation to become our next President isn't to "shatter a glass ceiling," He boldly stated, in a matter-of-fact kind of way. Where is he going with this? Of course she is! I ordered Made from 100% Shattered Glass Ceiling stemware from HillaryClinton.com for Christsake! He pointed out something far more interesting. He followed, "Hillary wants to be President because she knows there is so much work to be done." His eyes were intense. "She knows that she can get the work done starting from day one, and make a real difference."